Los Angeles, CA February 8, 2018 – The Orlando Closet Factory office spearheaded a company wide effort to install modern closet designs for the 10,000 square-foot showcase home designed and built for this year’s National Association of Home Builders’ (NAHB) New American Home project in Bella Collina, a luxury golf community just 30 minutes outside Orlando. While the project was led by Orlando Closet Factory president and owner, Jack Green, nearly 40 additional Closet Factory offices from Maine to Los Angeles contributed all of the necessary resources to modern closet designs and accessories for the showcase home built and designed by Legacy Custom Built Homes. This modern wardrobe closet designed for the New American Home project sponsored by the NAHB. According to Green, Closet Factory was the only closet company chosen to be included in the New American Home Project. “It’s a very big deal for us. 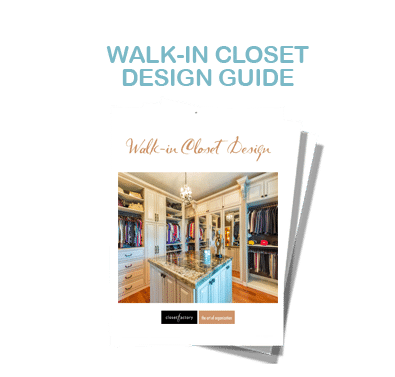 We’ve been coordinating the design and installation of closets for the New American Home project for the past six or seven years now,” said Green, president of Orlando’s Closet Factory since 2003. “The real key about this show is that everybody is only using the most modern products and building techniques. It’s meant to be state-of-the-art construction, state of the art energy saving. All the newest and greatest stuff,” said Green. The New American Home project highlights the most modern advancements in building technology and design trends, including modern closet designs, by constructing a new home from the ground-up. This year marked the 35th edition in a series of cutting-edge exhibition homes sponsored by the National Association of Home Builders (NAHB). Once completed, the New American Home is registered as the official show home for the International Builders Show. The real key about this show is that everybody is only using the most modern products and building techniques. It’s meant to be state-of-the-art construction, state-of-the-art energy saving. All the newest and greatest stuff,” Jack Green, President and Owner, Orlando Closet Factory. According to Green, this year’s event drew more than 84,000 people, including thousands of international media scrambling to see the best-of-the-best in American construction practices. “This show and our contribution gives Closet Factory a national stage, and allows us to become exposed to an international community. Builders from around the country attend this event pretty religiously, and it gives us great insight into the latest trends in construction and building materials,” said Green. A recent study of the Freedonia Group found that modern closet designs is one of the fastest growing additions in newly constructed homes, and is expected to reach $10.5 billion by 2019. 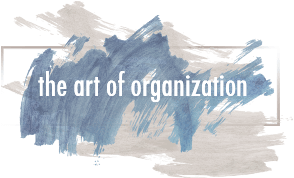 As a nationally recognized brand, Closet Factory also believes that working with organizations as the NAHB and the New American Home project is also a matter of good business. 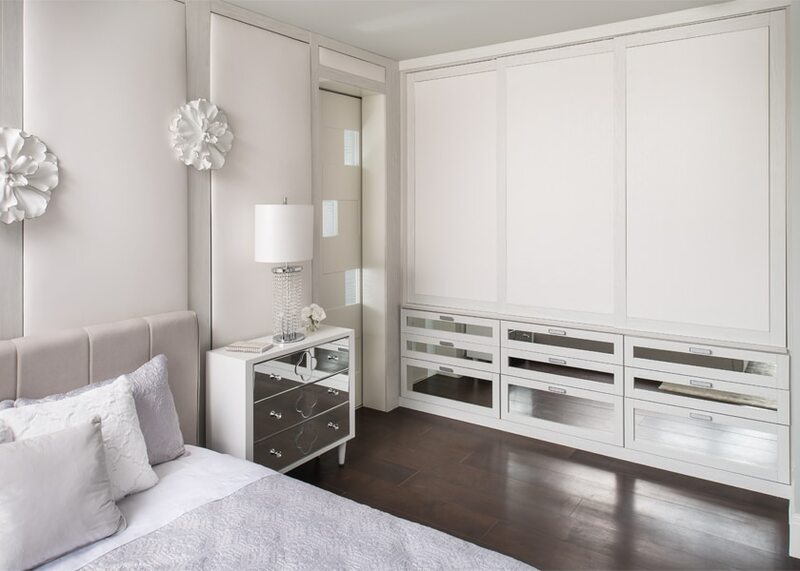 This modern bedroom wardobe design was featured in NAHB’s New American Home project. “Closet Factory has spent more than 30 years perfecting our design processes and installation techniques for custom storage solution systems. 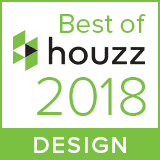 Being able to highlight our expertise during this year’s New American Home project was a great honor, and an important contribution to the nation’s building industry,” said Dan Grandon, President of the Closet Factory Franchise Corporation. 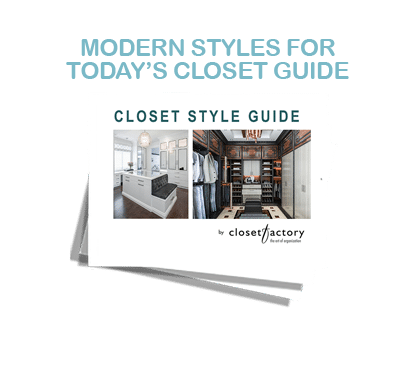 Even with delays from Hurricane Irma, and rigid installment timetables, Closet Factory successfully created three modern closet designs that set the high-water mark for the entire closet industry. “In the master his and her walk-in closet, we went with white and lots of LED lighting that was accented with high gloss finishes. We tied into the theme the builder and designer wanted. For the other two closets, we used our Finesse system that uses rich textured wood grain melamine finishes that are the newest melamine materials,” said Green. For the other closet, we framed the room out with melamine, and added leather padding on the doors which matched the theme of the room,” said Green. Closet Factory’s Finesse modern closet design system was inspired by Italian home design, that highlights textured finishes, and suspended shelves that have varying depths and hidden hardware. The system works extremely well for creating a very modern, boutique feel. The new showcase home will be on display through mid-March. What Are Today's Walk-In Closet Trends?